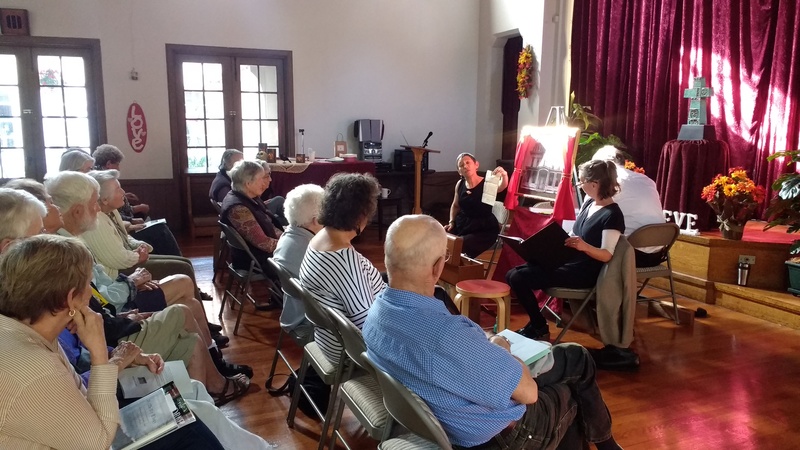 Almost two years after its premiere (10/31/15), Storytime for Adults returned to Ashby Village with a reading of William Faulkner’s iconic short story, "A Rose for Emily." Although this is one of his most accessible works, "Rose" still bears his long, convoluted sentences, which create a particular challenge to performance and comprehension. To help with the problem, the readers presented the text with as many aides to understanding a spoken text as possible: multiple readers took sentences apart to make clear when there were multiple speakers or points of view; visual elements help ground the audience by making clear what is currently happening in the story. With any art, practice improves and informs performance, and Storytime for Adults have become a tight group. Ashby Village was happy to invite them back; we're eager to see any production they’ve got. The performance was followed by our bimonthly potluck, to which the performers were invited. Storytime for Adults works in connection with the Berkeley Public Library. The group provides outreach services to loyal patrons who, because of mobility issues related to aging, are no longer able to easily come to the library. To help gauge public reaction, Storytime for Adults now ask the audience to fill out evaluation forms. To increase the playful atmosphere, the organization music while the forms and pencils are handed out; raffle tickets for the door prize immediately follows form collecting. - Very engaging presentation with varied backdrops and kinds of puppets. I particularly enjoyed the inflection and pauses of the voices. - I loved the presentation! Switching voices added interest and charm. The props also helped enliven the story. My recollection of Faulkner is trying to slog through his interminable sentences in a college English course. It was so great to have them made so accessible. - I enjoyed it, as I enjoy Faulkner. It benefited from the shifting voices and elements because of his slow pace. - The puppet and stage are very imaginative and the three Performers are terrific. - I liked every bit of it: the reading, the props, the story itself. Pacing was perfect, acting just right. One Possibility – a little louder. Special thanks to: volunteer Ben Sikora, for his many support roles in the production, and expanding his participation to a speaking part which lends a needed visual and auditory diversity to the presentation; Teresa Albro, for the extraordinary flyer we just keep updating; Anwan Baker, for his ongoing support of community outreach and staff creativity to fulfill our mission statement.